Meyer revealed Wednesday that he required arthroscopic surgery on his right shoulder in November, Jeff Fletcher of The Orange County Register reports. 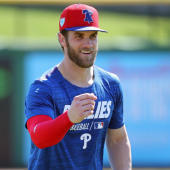 Meyer was sidelined for the entire 2018 campaign after requiring surgery in September 2017 to repair the labrum in his same shoulder. It was expected that he would have a relatively normal offseason before returning to camp this spring at close to full strength, but the fact that he experienced a setback that required a follow-up procedure now muddles his outlook for 2019. While the scope won't necessitate as long of a recovery timeline as the surgery he needed to repair his labrum, Meyer has yet to resume a throwing program and looks like a good bet to open the season on the injured list at Triple-A Salt Lake.